In September, we experienced our first Multigenerational service of the new church year, the water communion. 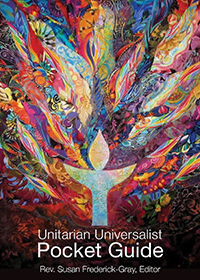 We spent a good deal of time reflecting on our Vision for ourselves as Unitarian Universalists. We acknowledged that we are seekers, looking for truth and meaning wherever we can find it. We can find the “truth” when we look within ourselves and listen the sound of our inner wisdom. We can find answers from sources outside ourselves in books, nature, science and from other wise people who inspire us. If we are spiritually inclined, we might look to spirit guides to help us find answers. Some of the “Dreams” we have include, being a welcoming and accepting community and building a fair and peaceful world by using our strengths to help solve problems we care about. Our theme for October is Memory. We will look back to explore where we have come from and whose “shoulders we stand on”. We will also consider whose stories we might have neglected in our histories. Where have our “cultural biases” covered over unpleasant experiences faced by underserved communities? Although it is not always comfortable to think about, it is important to hear the real stories of injustices so that we can acknowledge the pain we have caused and move forward in faith together. Our Multigenerational service will be at the end of the month and celebrate Dia de los Muertos. It’s an exciting time and our Reverenda does an amazing job decorating the sanctuary for this holiday which is dear to her heart and cultural traditions. Pre-registration is available until 3 p.m. Thursday, October 25, 2018.